My neighbor told me the 9 pointer was the dominant buck in this whitetail herd, and I had always thought he was very imposing. This video starts with a 10 pointer, who looks to be a year or two younger, and who obviously isn't ready to challenge the 9 pointer who arrives to make sure the younger buck knows who's herd this is. 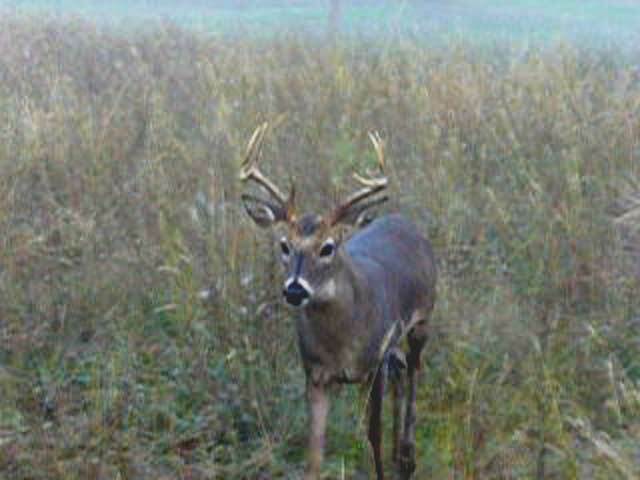 The nine pointer has a small point on the inside of his right antler but not the left. This is the first time in my life I have seen whitetail deer mating, and I just happened to have my camera running. What luck! The lower video is in 640X480, 27 MB, and plays with the Windows Media Player. Much better if you have a high speed connection. For high speed connections, here's a 17 MB file that plays on Windows Media Player in 640X480 size. Click on the picture to start the video.